Add to Cart to confirm shipping cost to your location. 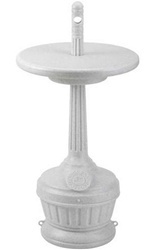 This 30" tall Smokers Outpost Ashtray includes a removable 15" diameter table. The Patio with Table Smokers' Outpost is designed for seated areas. 15" diameter table creates a practical piece of furniture. Oxygen-restricting design automatically extinguishes cigarette butts. Steel pail liner collects butts and makes cleaning simple and easy.